I hope 2019 is off to a great start for you! We are days away from beta testing our next cycle which brings dynamic content to the builders, a significant update to Skeleton Mode, a new Extension, and nested content! Starting from the end, nested content has been a highly requested feature for sometime (also known as nested columns). While there have been ways to more or less get it done, you will now be able to do so natively in the builders with a new Row Element that can be dragged into your page from the Element library. You'll also be able to move existing rows around through a slick new update to Skeleton Mode. With the new Skeleton Mode you will be able to drag content around allowing for greater flexibility to your page content. Skeleton Mode will be unlockable as well allowing you to look at the tree view of your page whenever you’d like. We're eying this updated Skeleton Mode as the potential future for the Layout pane in our builders. It follows a folder structure that we are all familiar with and cuts down on the height of the current layout significantly in addition to making it super easy to move content around (for example a row to a different section or Elements to a distant column, etc). It would introduce a slight adjustment to the current Layout pane in that you would need to click into the section to administer rows, columns, etc but in playing around with it internally we loved the flow. It made the layout pane feel much more approachable and significantly improved things like moving nested content around while bringing visibility to everything from a structural standpoint. Here's a screenshot. Prior to making these changes or any final decisions, we wanted to bring the experience to Skeleton Mode and see how it helps. We think it will be a big win, especially with our upcoming layout builder and future development plans. We're keen to get your feedback once its live. 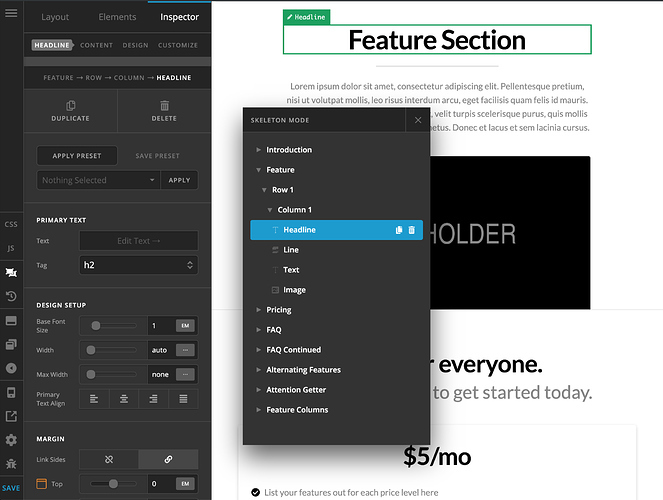 This release will also debut another great Extension to our growing library of plugins. This tool alone costs $99 when purchased separately and as with all of our Extensions is included with each theme purchase (including updates and support). Stay tuned! Finally, there is dynamic content to the builders! You'll be able to set the content of your Elements to various fields like the current post title or WooCommerce cart title. Any Element that allows text input will have a button that will open a panel showing the available fields. This will be especially powerful in the Pro header builder since your headers can get information from the current page context. For example, you could show the current page title in one of your header bars instead of managing that in the page design. It will also have ways to retrieve custom fields that you set in WordPress natively or through plugins like ACF or Toolset. Like the new Grid, this feature is going to be foundational for the upcoming Layout Builder. One quick note on our new Grid. We have pushed this to the Layout Builder cycle (the release after this one) due to some challenges we experienced that will be easier to address in that cycle. Our goal with any new feature development is to keep the workflow as predictable as possible so that even though new features are being added, it is not at the expense of a good user experience. If you are interested in helping beta test the next cycle be on the lookout for an announcement in the next couple days! We would love the help to make sure everything is working as expected. 2019 is going to be an incredible year on the product front, and we are excited to kick things off with this first update of the new year.